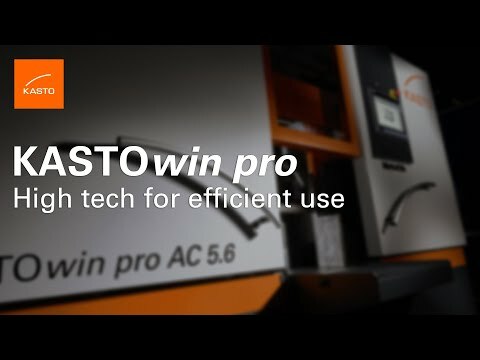 KASTOwin pro A 5.6 - KASTO - Saws. Storage. And More. The high-performance band saw KASTOwin pro AC 5.6 is optimized for solid material, tubes and profiles. Users will appreciate its short cutting times, long tool life and intuitive operation. The fully automatic machine is optimized for bimetallic and carbide blades and can be applied in areas such as the steel trade, steel production, forging mills, machine manufacturing and the automotive industry. Besides helping to reduce tool costs, it significantly increases production speed and efficiency. Depending on the type of blade, cutting times can be reduced by 50 percent and more. The KASTOwin pro is designed for a wide range of applications and delivers top performance with both carbide and bimetallic saw blades. An important feature is its innovative feed system, which is controlled by means of two ball screw spindles, each with a servo drive for precise, infinitely variable control. The KASTOwin pro AC 5.6 also has a retraction unit on each side for lifting the blade from the surface when the saw head moves back. This makes for particularly efficient, exact sawing with minimal tool wear. In addition, this fully automatic saw comes with EasyControl, an advanced control unit. It is easy to use and reduces idle times in automatic operation for maximum cutting performance. All parameters can be optimized to match the type of blade being used.